Yesterday, I wrote about pedaling Uniworld’s bicycles and returning to my oasis of tranquility, the S.S. Maria Theresa, a floating boutique hotel (with gourmet restaurants) cruising through the heartland of Europe. My own personal oasis is a category 1 stateroom measuring 194 square feet. Stateroom 425 is situated on deck four, port-side aft, a few steps away from the Leopard Bar, a convenience that I appreciate whenever I am parched for a complimentary glass of champagne or a cocktail — or an afternoon tea (I’ll take you for a photo tour of the Leopard Bar later this week). My stateroom is quiet (no noise from the corridor or slamming of doors to be heard) and comfortable, with a king-sized handcrafted canopy Savoir of England bed, among the most comfortable beds I’ve ever slept on, with crisp high-thread-count Egyptian linens that are a delight to sandwich in between. My stateroom, as all staterooms on S.S. Maria Theresa, features sumptuous fabric-wall coverings combined with rich-handmade carpets, antique furnishings, original art and, behind a mirror, a flatscreen TV with infotainment center. I feel as though I am living in a palace, with all the modern technology. 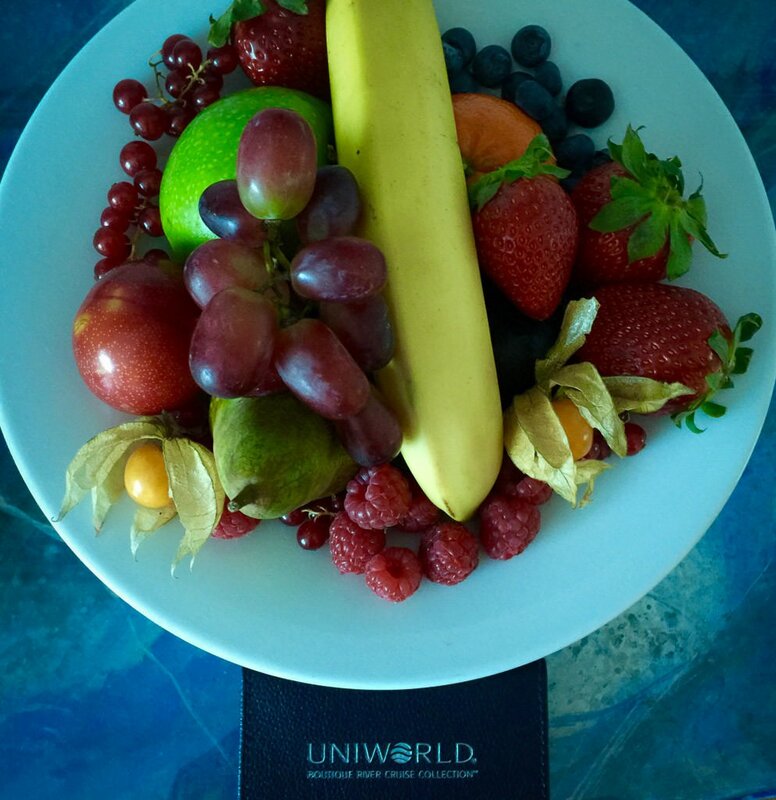 As a River Heritage Club Member, meaning that I have cruised before with Uniworld, I received a few extra perks in my stateroom, including a complimentary fruit platter upon boarding and free laundry, one bag per week. Should I require more than that, I can pay for laundry service. 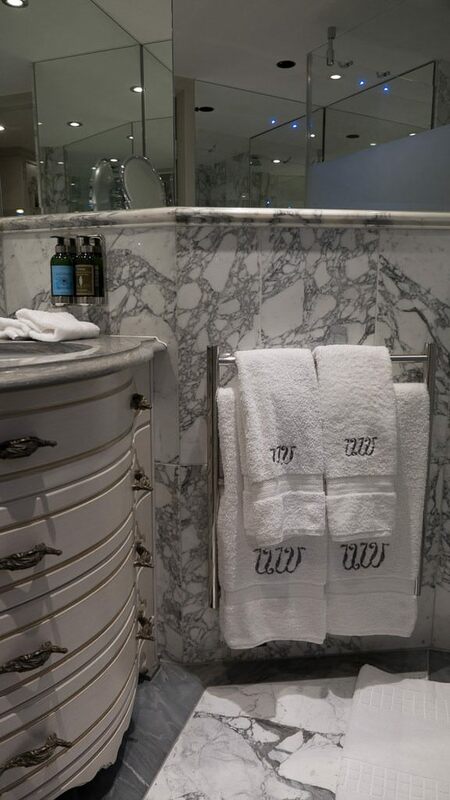 S.S. Maria Theresa also has a complimentary self-service launderette on deck 2. My marble bathroom has a large shower and single sink with L’Occitane en Provence products, lighted magnifying mirror, hair dryer, thick towels and soft robes. There’s plenty of storage, so don’t be shy about bringing along your entire toiletry kit. Stateroom lighting and electrical features are state-of-the-art, with such features as USB charging outlets built into the receptacles, both European and North American style. 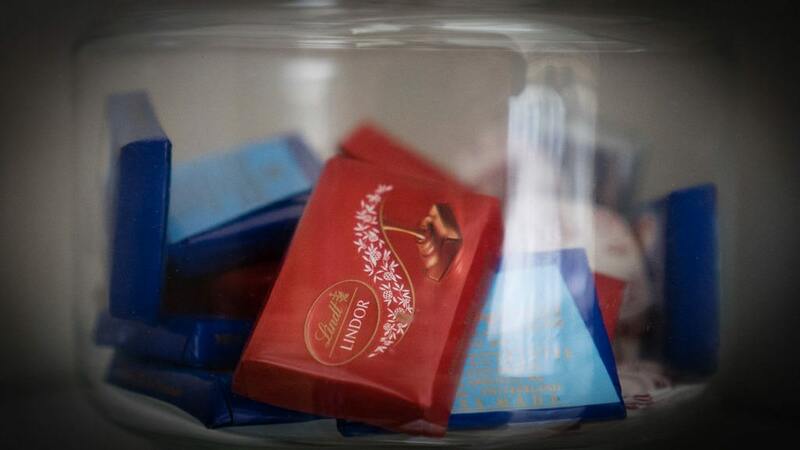 Mineral water, and a bowl of cute and delicious chocolates, are replenished as needed, a nice touch that gives S.S. Maria Theresa a homey feel. 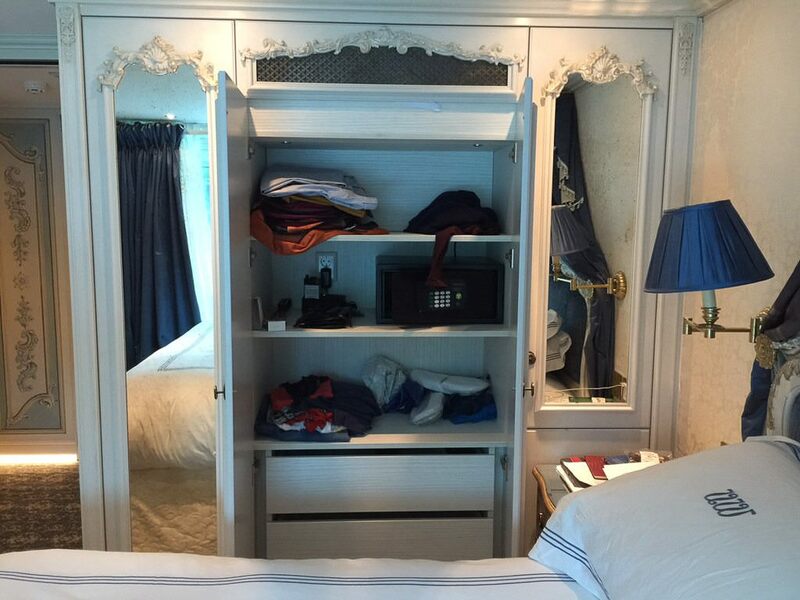 Via Twitter someone asked: Any truth to the reports of some cabins not having ANY drawers or storage shelves? There is no truth to that. Cabins on deck two, in the lowest category, feature small two small closets. One of the closets is a wardrobe with a shelf at the top. The wardrobe will allow full-length dresses to hang unobstructed. The other closet has hangers and shelves, as well as a safe. I suspect more drawer space may be added in this category if the lack of space is brought up in guest comment cards. There is room for drawer space to be added along the wall at the foot of the bed, where there is currently a writing desk occupying part of the wall. My cabin features a series four small closets, with plenty of drawers and shelves. The outer closet (to the left in the photo) has two rows of hangers. The inner set of closets, which is opened in the photo above, has shelves and drawers. The outer closet to the far right in the photo is a full length closet, but only the upper door is accessible. Plus, there is an obstruction inside that allows for only a few items to hang. My advice, as always, is to pack less. Doing so makes traveling much easier than carrying multiple suitcases packed to the max. You only need a third of what you think you need when traveling on S.S. Maria Theresa. If that worries you, bring half of what you think you need. 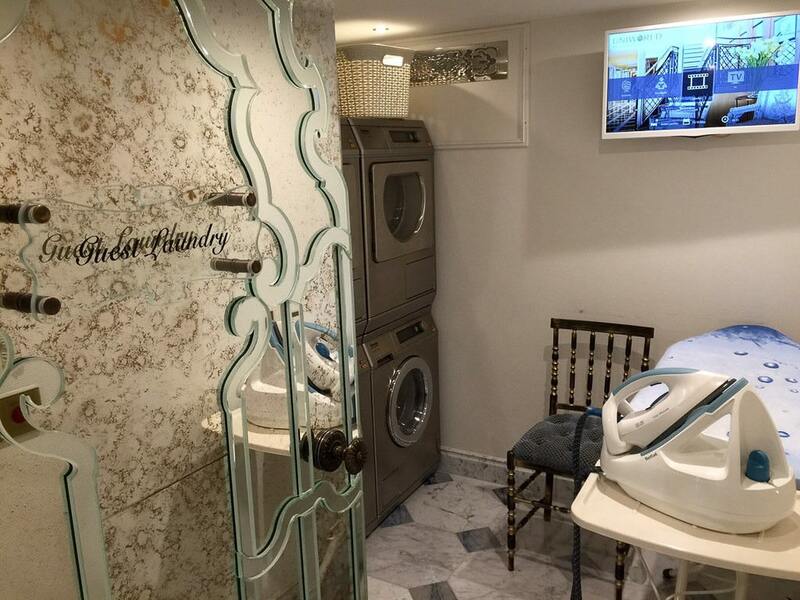 S.S. Maria Theresa features a laundry service for a fee (underwear €1.20, jeans €4, blouse or shirt €3.50) as well as a complimentary self-service launderette with three washers and dryers and an ironing board. Soap packets with softener are provided at no charge. Keycard technology has been enhanced by electronic boards that instruct service staff whether the room is occupied or not (for cleaning). Not once, did a room attendant knock at my door or enter unexpectedly. I really like this technology as it assures privacy and no interruptions. 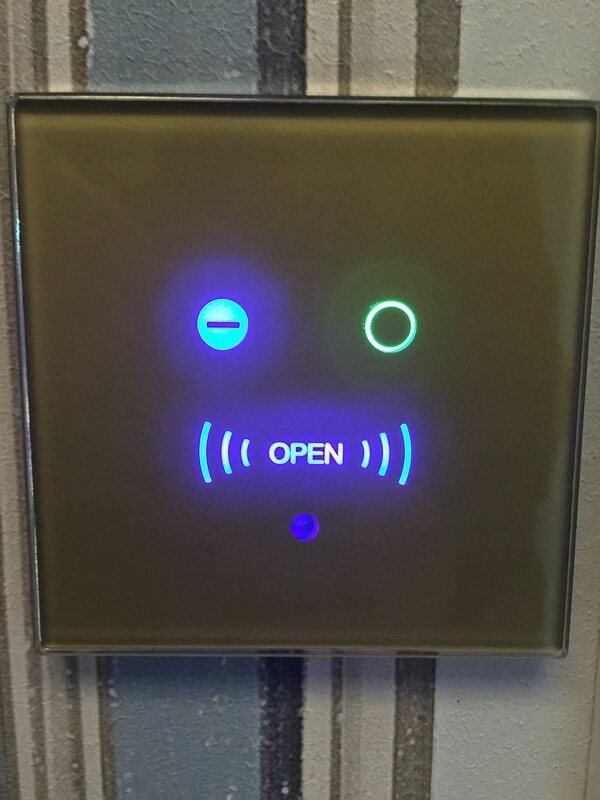 The green light, indicating the room is unoccupied, is only engaged when you take your keycard with you outside of the room. My favorite feature, however, is the open-air balcony, which I am saving for a video that I will post tomorrow. For now, enjoy the photo below, a significant moment for those of us on the S.S. Maria Theresa, as we crossed the Continental Divide to begin making our way to Budapest. The photo doesn’t begin to do justice to the beauty of the night. The river was quiet, except for the songs of birds and of crickets and the gentle parting of the water as the S.S. Maria Theresa pushed her way across the divide. 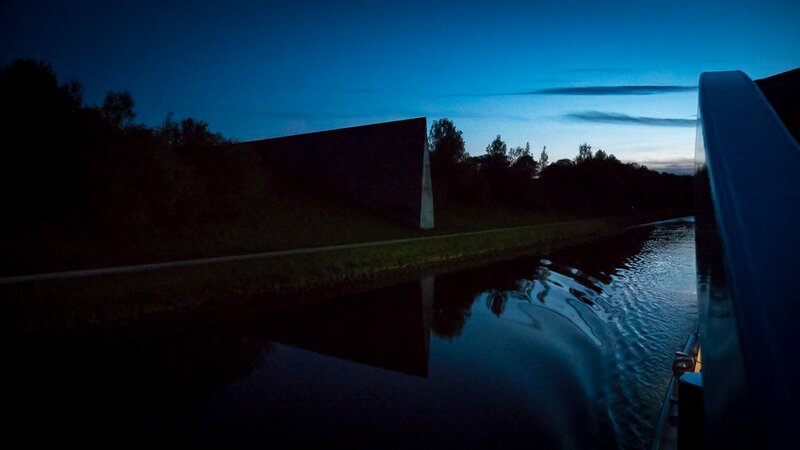 We were well over 1,000 feet above sea level, a feat that required that S.S. Maria Theresa transit a series of 16 locks over the entire 100-mile-plus run of the Main-Danube Canal. It was a glorious night that ended with me back in stateroom 425, between the sheets of that big comfy bed and settled in for the night, ready for whatever the next day would bring. 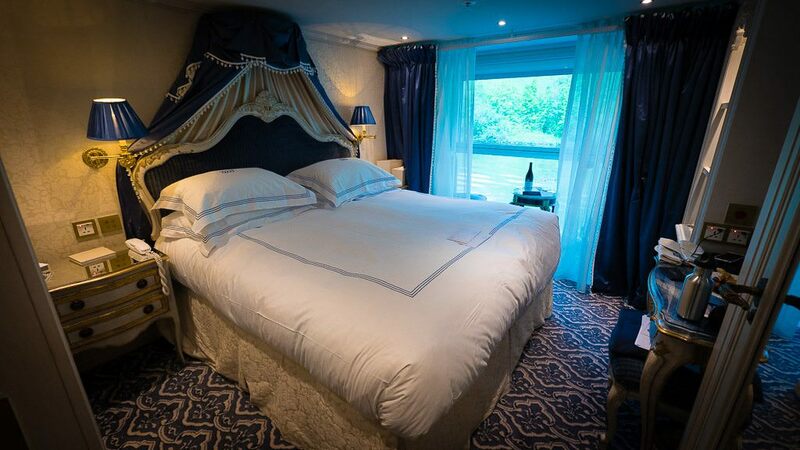 We have cabin 248…..on Maria Theresa. Will we be able to store luggage under the bed? Size of luggage? For most, yes. Is there any way to see some of the solo or lowest level cabins so one gets an idea of what to really expect? For many, that is our choice and it would be helpful to get a review from that perspective. Do we have the option for one of the private dinners in the lounge you mention or is that for a select few? What do these “drawerless wonder” rooms really look like? And what does a typical ships active tour consist of for those of us that have never been on a river cruise and/ or are just not avid bikers? I was able to see a category 4 and 5 stateroom but unable to get photos because they were occupied. They’re not bad by any means, but I know that doesn’t give you a lot to go on. Anyone would have the option of private dinners in the Leopard Bar but suite guest are given priority. Just ask at reception about availability when you board. The hotel manager and her crew are very accommodating. I did not cover tours, as you noted, but feedback was that they were good. You don’t need to be an avid cyclist to enjoy Europe. Just straddle a saddle and pedal along the dedicated bike roads as the locals do. You may be surprised at how rewarding that can be, which, of course, is why Uniworld has a fleet of bikes on each ship. Hope this helps! Ralph, the windows in the category 5 staterooms are just like the one in the cafe on the lowest deck. Kind of an aquarium feel, they are up fairly high as well. We were glad we didn’t save money and opt for one. But the rest of the cabin is furnished exactly the same, the window and size are the only difference. Thank you for sharing this information. Always appreciate your comments. Imagine the tours are pretty much done the same on all the Uniworld ships. We did the Beatrice for the Christmas markets. They have several groups for each tour, and all include a gentle walker tour for those who don’t want to zip along. We decided to join that group which was not, surprisingly filled up with elderly people by any means, but folks who had or were recovering from a variety of physical problems or who just didn’t want to walk fast. I wouldn’t worry about the private dinners, They sound elegant, of course, but the everyday dinners were wonderful on the Beatrice and frankly I wouldn’t miss the special dinner if we couldn’t get reservations. We will be on the August 9 sailing and are looking forward to it very much. if you go to the Uniworld site, you can print out an extensive itinerary day by day. I didn’t do that for our first cruise, but have done it already for this one. That way you can google the various sites and decide which tours you want to take. I hope we get to the BMW factory tho the museum would be OK, as I write about auto racing among other things. Thanks for your input. Those who did the BMW factory tour loved it, especially those who owned BMWs. The private dinner? You’re right. The dining room is a treat. We did enjoy having a table for two at the back of the ship for the private dinner, and if you can do it, go for it. I am still trying to clarify with Uniworld who it is open to. The website says it is a perk for suite guests, but I know some people who weren’t suite guests dined there, including yours truly. I did see people of all ages on the bikes, even people who said they had not ridden in years (many years for some), but the bikes are in good condition and easy to pedal. Plus, Europe’s infrastructure for bikes (and its bike-aware drivers) make cycling seem safer and easier than in other places, such as the US, where I am from (though I spend a lot of time in Sweden too). Thanks again for your thoughts ENystrom! It may be that those who have traveled with Uniworld before are eligible as they seem to do it more often on the MT. On the Beatrice they did have one special dinner for those in the suites. Our best new friends went to it. As to bicycling, after having both hips replaced my surgeon says it, like jogging, is a no. It’s not that you can’t physically do it, it is the danger of falling if a joint gives way. Love to bicycle on flat terrain but alas, no more. Drawers in cabins 208 on Maria Theresa Another poster mentioned that there were no drawers in the staterooms on the lower deck. He mentioned 207, we are booked in 208 which I thought would be the same. I contacted Uniworld about this as European Jewels is a 2 week trip and drawers would be nice. The Uniworld representative checked and emailed me that there were indeed drawers in the cabin 2 on each side of the bed, one in the nightstand and several in the closet. So this is the scoop on cabin drawer. Still hoping we will get lucky and get upgraded but no matter what, looking forward to trip. We will appreciate you keeping us informed ENystrom – and take pictures if you are able. They can be added by clicking the little image icon in the bottom bar of the contents box. Yep, that’s me and a few cycling buddies in the image below. I have now done two Uniworld cruises, Venice and the Po River, and most recently (March), Paris and Normandy. I am rather young for a river cruiser, but can’t see sailing on another line. I agree that the level of service is top notch. I also really love the new “all-inclusive” pricing. We didn’t have this with our Venice cruise, and it was so nice not to have to worry about having smaller currency for the guides, bus driver, etc. In addition, it seemed like the guides and drivers were actually MORE enthusiastic/helpful with the all-inclusive plan. I am really looking forward to sailing on one of the newer and bigger ships in the next few years. The Maria Theresa looks beautiful. I did see the following post on CruiseCritic, and wondered if you could confirm the validity of this observation/complaint. This gentleman later noted he was in cabin 207. The cabin we had on the River Baroness was very small-probably one of the smallest in the fleet, and still had small drawers (enough for socks and underwear) on either side of the bed. We also had very little closet space, but easily managed to have enough room to hang clothes, plus, we had shelving within the closet. I’m finding it hard to believe there were neither drawers, or shelves. Looking forward to the rest of your cruise-LOVE the balcony video! 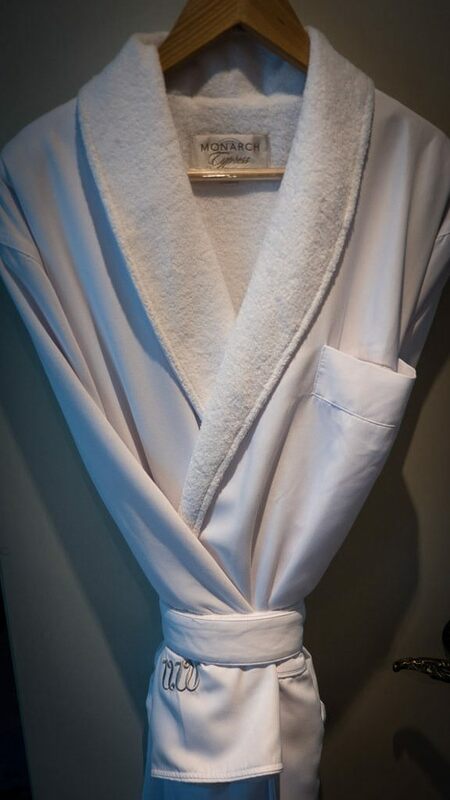 When we got to our cabin, we called the front desk to ask where the drawers were for our clothes. After all, the ship is taking a 14 day cruise, so we figured there must be a hidden chest of drawers. The answer we got back was that there were cabins that did not have any drawers and ours was one of them. We were floored. You go on a cruise to not have to live out of a suitcase and now we were being forced to…well…. live out of a suitcase. When we talked to the hotel manager, she apologized and said it was a design flaw. But she didn’t offer any useful remedy. Thank you for your very nice comments Robin. 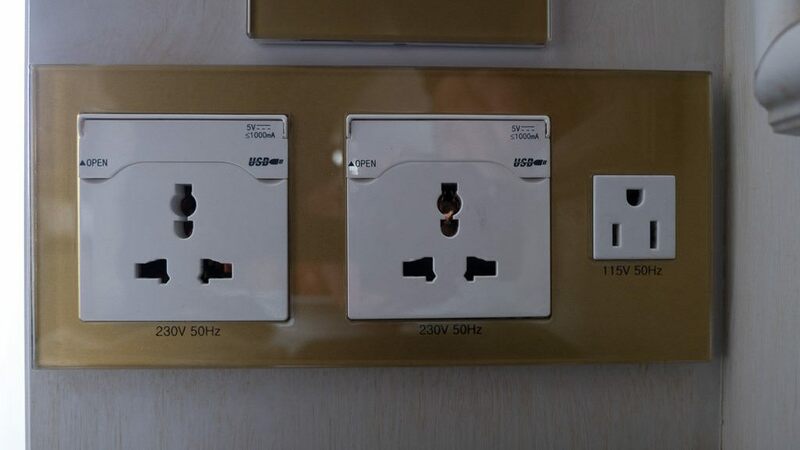 As for the Cruise Critic reader in room 207, I believe that Uniworld does, in fact, regard its guests highly and will address the issue of drawer space in the lowest category of cabins. It was an oversight in the design – it happens on all ships. I just got off of Viking Star, where I spoke with Torstein Hagen, the chairman of Viking Ocean Cruises. He cited a design flaw in the buffet setup in the World Cafe on his new ship. So all ships have design flaws that are corrected in drydock. As for the drawers, storing your songs and underwear in your suitcase under the bed is not technically living out of a suitcase. I travel probably 300 days a year. Lugging your suitcase from place to place is living out of a suitcase. Having to reach under the bed and pull out your suitcase to grab a fresh pair of underwear and socks is not a major inconvenience. As we say, this is a high-quality problem. That’s all he had to complain about? Still, I get his point. Uniworld is aware of it. I’m not apologizing for the company. They made a mistake. I’m sure it will be fixed. Thanks for getting responding Ralph. There’s no doubt in my mind Uniworld will fix it. Like you, I adapt easily, and this wouldn’t have impacted my trip in any way. Eep, we are in Cabin 208 for our cruise on the Maria Theresa August 9, the cabin is 162 sq ft, so bigger than the one we had on the Beatrice, but no drawers? Surely they have a closet or something. If not, will adapt and hope for an upgrade as we are members of the River Heritage club. Ralph, actually, he didn’t really like the decor either “I want a ship that has more tasteful decor and provides an interior frontal view,,,” We loved the decor on the Beatrice and I’m sure we will love the decor on the Maria Theresa. We leave Aug. 14 on the Maria Theresa and Im taking my 13 year old son… We are currently booked in category 5 and I just realized the room only has 6 inch windows that are high up and can’t be seen out of unless you stand on something! For the amount of money they charge I would think one would at least get a decent window so see out of! Im very upset about this! ….and now No drawers? This is common for most river cruise lines’ entry level cabins. A quick check on Uniworld’s website would have shown you a picture of the cabin. I’d say the windows are more like 12-15 inches, though. And, honestly, you’re hardly in the cabin, except to sleep and change clothes. We will be sailing on the Maria Theresa August 9, from Budapest. Couldn’t justify added cost of the larger staterooms so we will be on the lowest deck, sigh, but we like Uniworld so well that we chose our cabin over a suite on another line. Figured we wouldn’t spend much time in our cabin anyway, and there seem to be many places to hang out topside. We were on the Beatrice for the Christmas Markets and really enjoyed it despite the really abysmal weather. Just retired from 27 years teaching History at a university and am working on a blog. mainly travel, for restless retired folk. The service on board alone probably justifies your switch. Yes, the service was the main reason, we were treated like royalty in the best sense. Though our bicycling days are over, the Uniworld bikes are very similar to ones we bought to carry on our motor home, fun to ride. Another thing I really like about Uniworld is the “Gentle Walkers” group. We decided it would be best to be the fastest in the slow group, rather than the slowest in a fast group, thus we joined the Gentle Walkers (nice name) and were able to help others once in a while. Aging is often humbling for the athletic.